MyEnergy Monitor is a small desktop utility that allows users to monitor important aspects of various forms of energy in South Africa. The monitor currently focuses on power and fuel, with more areas to be implemented in the future. Power cuts ("load shedding") have unfortunately become the norm here in South Africa, and by Eskom's estimates, will be with us for a few years to come. So instead of having to live with losing unsaved data and documents, damaged computer hardware and inconvenience in general, we have taken a proactive approach to power management. 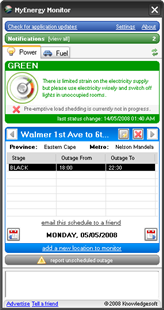 The monitor allows users to monitor Eskom's current power status, as well as the schedules of multiple locations which are of importance to them (home, work, clients, suppliers, branches etc). MyEnergy Monitor’s aim is to remove the confusion of Eskom's loadshedding schedules (as well as the schedules provided by independent municipalities), and instead present only relevant and important information in an easy to understand format. In addition to allowing users to monitor schedules, MyEnergy Monitor allows users to specify custom actions to take upon the detection of a scheduled power outage. These include a simple desktop notification, automatic computer shutdown/hibernate, file/script running (run a script to send an sms/backup a database etc) and windows event log writing. With fuel prices climbing and changing every month, it can be easy to lose track of time and forget to fill up your tank before the price goes up. Users can now setup notifications in MyEnergy Monitor to receive regular reminders days before the new fuel prices come into effect. If the cost of fuel is an important factor in your business, or you just want to make sure you're on top of the latest changes, download the MyEnergy Monitor now! Be sure to check this site as well as the blog regularly for updates and information about the MyEnergy Monitor! The current power status was not able to be determined. Pre-emptive load shedding is not in progress. * the values are calculated using the schedules we currently have in the system, based on the outages at . these values do not apply if pre-emptive load shedding is not in action. ** users can report unexpected outages using the MyEnergy Monitor desktop tool. values are updated every 15 minutes.